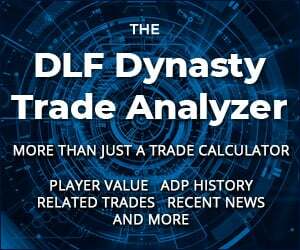 Our monthly dynasty mock drafts are nearing an end, meaning it is time to reveal the latest dynasty ADP. I nearly opted to skip the month of November for our dynasty mock series, but I’m glad I didn’t as the latest version of our ADP gathering tool brought about great change in many important players. Here, I’ll be taking a round-by-round look at the newest data, along with sharing my thoughts about a few key players. Fascinating. From the 15th pick through and including the 5th round, I don’t really love the value of most of the players. I think that the value of the players in rounds 6-8 relative to their draft position is FAR greater than those from the middle of the 2nd round through the fifth round. In other words, I’d be comfortable moving 3 if not all four of my 2nd, 3rd, 4th, and 5th round picks. Ideally, I would package up two to get another 1st (e.g., my 2nd and 3rd) and then trade my 5th for, say, a 6th and an 8th. (I’d like to keep the 4th in case someone that I love falls). Of course, the incoming rookie class might shift this a bit, but the point remains: there is value in the top-14 players as studs and then the mid-tier players in round 6-8 but, IMO, not in rounds 2-5. How many of the third and fourth round picks of Michael Thomas were you, Ryan? I don’t mean as a criticism, but you do have the ability to weight the draft.